Back to mechanical keyboards. If you are a writer and have not tried these out yet, you are missing out! 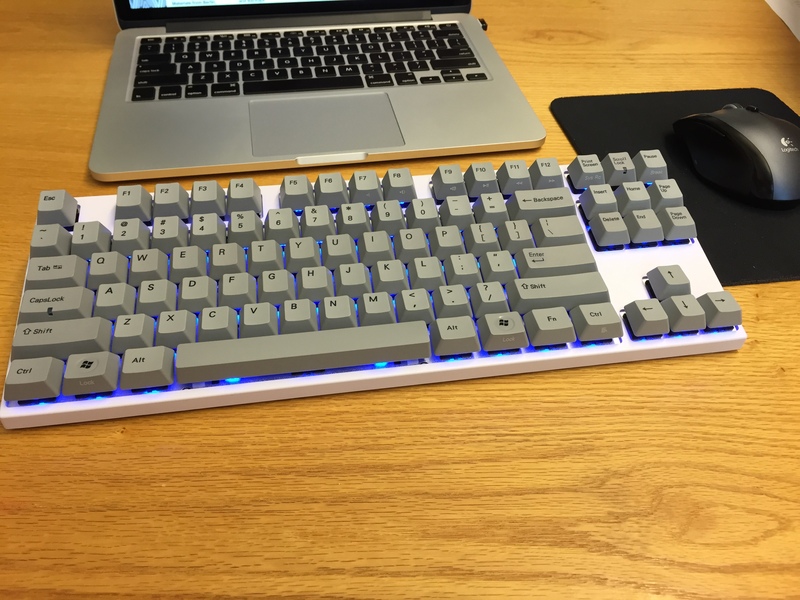 This particular board is from Varmilo, a brand unknown to me before. What got me interested is that this one is bluetooth, meaning it is wireless! I really like that. It keeps the desktop clean and leaves a USB port open. There are other peculiar things about this keyboard that I did not have before. As you can see, it has blue LED underneath the keys. It sort of looks alright in a darker room, but under daylight conditions I find it tacky. Think christmas lights gone wrong. A distraction. Perhaps to help the LED lights, they keys are raised on this board, another feature which I do not like. I am sure that within a short period this will be showing a lot of dust and crusts underneath the keys – something I do not need to be seeing. On the other hand, this low profile and in general the sleek design of the case makes this board very compact and neat. The grey keycaps are gorgeous though, nearly perfect for what I would like. Their shape, size, lettering, and color strike a very nice balance. The most important aspect is of course the switches, in this case Cherry MX Green switches. Greens feel like in between an IBM Model M and a Happy Hacking Keyboard 2. This means that they are on the heavy site, have a relatively late tactile feedback, and a low muffled sound. I kind of knew that this was not going to work for me but my curiosity took the better of me. Turns out it indeed does not work well for me. Since both buckling spring (Model M) and Topre switches (HHKB2) are considered superior switches, I would say that Cherry MX Greens could be an interesting alternative for people out there.